Inked characters with Copic liner brush; inked backgrounds with Copic liner (.3) and black Copic marker. Edited and colored in PhotoShop. Attempting a limited palette proved much more difficult than I thought. Coloring this comic took over eight hours. I started over from scratch twice. The foliage is too graphically busy in comparison to the rest of the elements. It was a big mistake to overlay the red and white of the poles over the black and green of the trees. I end up with two competing sets of complementary colors, jostling against each other. 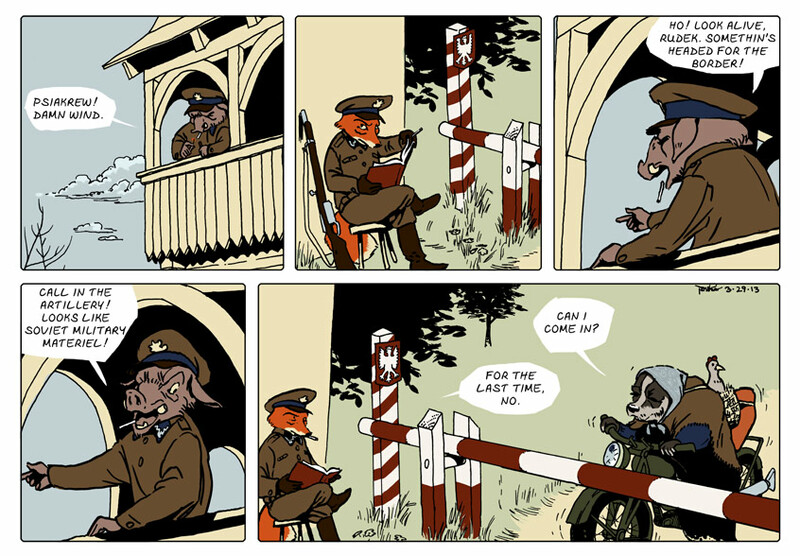 I tried to contrast two diagonals in the last panel: the old lady on the motorcycle, and the barricade. But I didn’t handle the composition carefully enough to create a depth of field. I think the old lady’s palette is not cohesive enough for her to read as a single element opposing the barricade. Going forward I think composing with colors will help me avoid these problems. I may try thumbnailing with a set of three or four Copics.